5th Apr 2019 - April can make fools of all of us! A cooler week with temperatures well below last week has slowed the fruit bud development slightly, but all we need is a return to temperatures in the high teens and blossom will be upon us in no time at all. The probability is apple in full bloom at Easter! 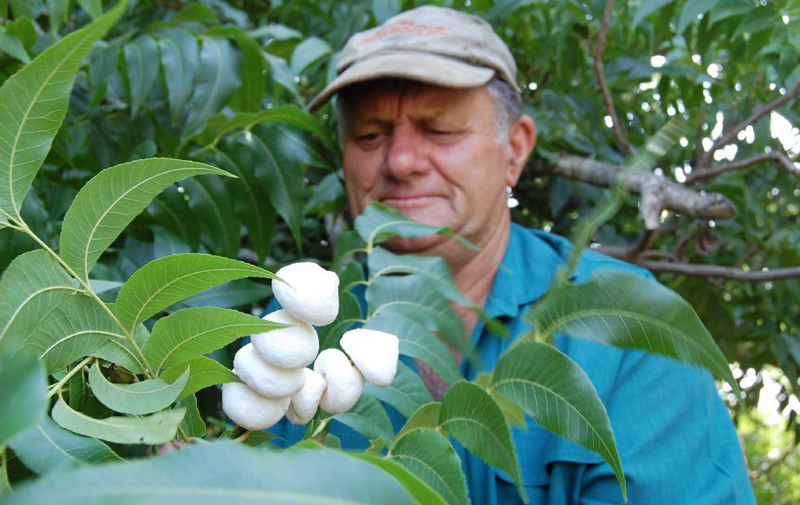 But frost can arrive and 'scupper' our hopes within an hour, which is why a Scottish Cherry grower is busy using his 'Frostbuster' to counteract frost at night. In last week's Journal the English Apple Man looked at the first commercial use of a Robotic apple picker, this week news of a Robotic raspberry picker in development. "We choose to go to the moon, and do other things, not because they are easy but because they are hard." This famous quote from former US president John F Kennedy was reiterated by the University of Lincoln's Professor Simon Pearson at SmartHort 2019. He explained that, whilst scientists across the world are busily tackling horticulture's global labour shortage, robotics are not quite ready to solve the industry's challenges. Pearson explained: "There's a five-year time horizon from invention to application to adoption in industry." He added that, to help the international horticulture community meet its technological requirements, people need to get together and launch ambitious, co-ordinated, large-scale, "moon shot approaches." "This space really needs the industry to come together and tell us what the big challenges are. Then we need to aggregate - pulling those challenges together into a few targeted areas where we can really move the dial. Because if you can do autonomy in one area you can do it for a range of other applications." Pearson added that future technologies will rely on "embedded intelligence," which means that people must "get together as a community and write some very big data sets so that we can start developing applications." The commercialisation of robot-harvested raspberries has moved a step closer after a University of Plymouth spinout company was awarded almost £550,000 to accelerate the development of its new system. 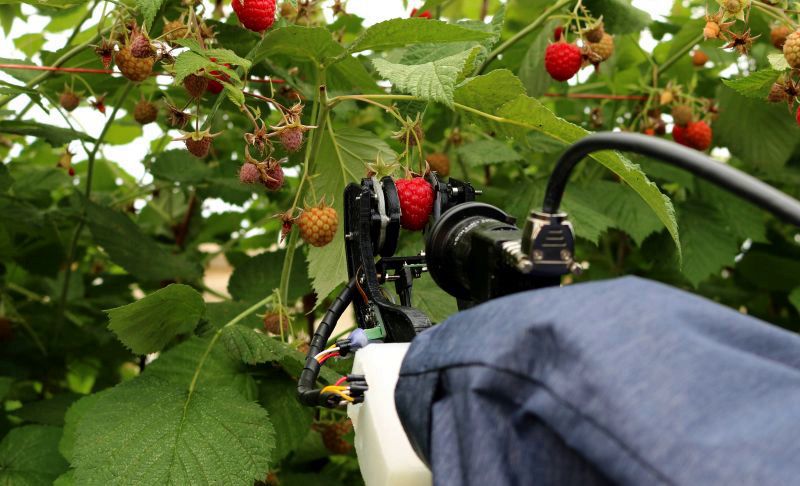 Automated raspberry harvesting could be a reality in five years time as concerns mount over labour availability once the UK leaves the EU. Reduced access to workforce could in turn see productivity levels fall at a time when consumer demand for plant based products is at its highest. However, raspberry growers concerned about labour availability could be using commercial robot harvesters on farm in five to ten years. Dr Michael Stoelen from the University of Plymouth, discussed his team's work on soft robotics at AHDB's recent SmartHort conference. They have built a prototype robotic arm which can pick a raspberry without damaging it in 12 seconds, however they believe once the robot is commercialised they can half the time it takes. While human pickers will still be required there could be significant savings for growers once robotic harvesting becomes a reality as labour often makes up over 50% of the cost. Dr Stoelen said: "These initial robots will not replace manual labour. What we expect is that they will be able to pick the more accessible fruit with human pickers there to pick the fruit which the machine isn't yet able too. "The challenge with designing robots such as these is not just in the delicate nature of the raspberry, but also ensuring they can cope with having people around them, as well as other complicating factors such as poles, sunlight and complex foliage." Dr Stoelen's team has focused on human biology as the inspiration for their robots, developing an arm which mimics a human's ability to shift between being robust and delicate when needs be. "We looked at human muscles, such as the biceps and triceps, and the way humans can flex and stiffen those muscles depending on the situation," he said. "We've also been using 'deep learning' to build a large database of raspberries which will make it easier for the robot to classify and grade them." Dr. Stoelen said: "We are delighted with this £550,000 grant award from Innovate UK and the Industrial Challenge Strategy Fund, which will help us bring forward the day when our robot system will be harvesting berries in the field." Reflecting back to the fruit bud development, in my garden, the Bladon Pippin, Red Devil and Red Windsor are between green cluster and early pink bud! 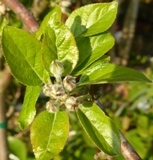 Out and about on Tuesday Conference Pears in West Kent were at the white bud stage and Bramley at Green Cluster. In 2017 the fruit bud development was very similar to this year at the same stage!